New Section for 2015: Goals!! We’re not quite sure why it never occurred to us in the past, but a new section of our manual has appeared in 2015-Goals! We took our annual planning and goal setting and boiled them down to simple sentences, then wrote them REALLY BIG and stuck them in our manual. 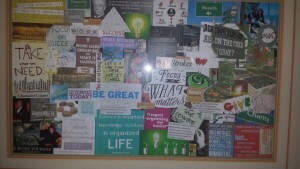 We also took a picture of our new Vision Board for 2015 and put that in there as well. What are your goals for 2015? Can you put them in some format that you can look to your manual for inspiration each day? How about making a photo of your vision board or your goal list into your manual cover? Then you’ll see it EVERY TIME you pick it up! We just wanted to share our inspiration and excitement with our new found manual section. Here’s to an amazing 2015!